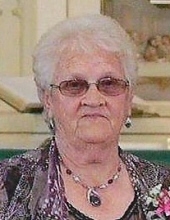 Virginia Storms, 81, of Richland Center, died on Thursday, January 31, 2019 at Gundersen Health System in La Crosse. She was born on August 29, 1937 in Richwood township the daughter of Julius and Minerva (Coppernoll) Dalberg. Virginia was united in marriage on June 25, 1955 to Robert Storms at the Richwood Methodist Church. Grandma Ginny has always been such a loving person. She would drop everything to help everyone no matter what she had going on. Her outlook towards family and life was truly inspiring. Her husband, children, grandchildren, great grandchildren, and friends meant the world to her. She loved each and everyone of us unconditionally. She had many passions in life; some of them included: crafts, quilting, gardening, cooking, baking and watching Wisconsin Badger Basketball and the Milwaukee Brewers. She held her dog, Daisy near and dear to her heart. Her family is going to miss her so much and she is now our guardian angel. Virginia is survived by her husband of 63 years Robert Storms, four children: Dale (Diane) Storms, Dave (Christy Koch) Storms, Mark (Joyce) Storms, Ellen (Steve) Deets all of Richland Center; nine grandchildren: Melissa Storms, Sarah Harris, Jenna Storms, Elizabeth Schauer, Erin Elliott, Cerresa Storms, Jesse Storms, Samantha Salisbury, Kelsey Deets; 15 great grandchildren, sister-in-law Shirley (Carl) Miller, cousin Gladys Anderson, many nieces, nephews and special friends. Virginia was preceded in death by her parents, siblings: Bernard, Buford, Donald, Rodney Dalberg and Kathleen Anderson; two infant sisters, Gladys and Jesse Dalberg, daughter-in-law Mary Storms. Memorial service will be held at 11:00 AM on Wednesday, February 6, 2019 at the Pratt Memorial Chapel. Visitation will be held on Tuesday, February 5, 2019 at the Pratt Memorial Chapel from 5:00 PM until 8:00 PM and again on Wednesday, February 6, 2019 at the Pratt Memorial Chapel from 10:00 AM until the time of service at 11:00 AM. The Pratt Funeral and Cremation Service is assisting the family with arrangements. Online condolences may be made at prattfuneralservice.com. To send flowers or a remembrance gift to the family of Virginia M. Storms, please visit our Tribute Store. "Email Address" would like to share the life celebration of Virginia M. Storms. Click on the "link" to go to share a favorite memory or leave a condolence message for the family.